The magical town of Taos, New Mexico, nestled where the foothills of the Sangre de Cristo Mountains meet the desert, creating enchanting sunsets, spectacular vistas and star filled Northern New Mexican skies at night. A land where the adobe architecture comes from the earth and there is something unique to do every season. If you are looking for a New Mexico vacation rental, Taos New Mexico is your ultimate destination and Desert Oak is the most distinctive Taos vacation rental. It’s a quick drive to Northern New Mexico’s array of activities: rafting the Taos Box, down the Rio Grande through the Rio Grande Gorge, with Far Flung Adventures, hiking Wheeler Peak @ elevation 13,161, Fly fishing native trout in the Cimarron River or the Rio Chama, visiting the Taos Pueblo to experience The Sacred Village and ancient ceremonies. There are further scenic drives to the weavers of Chimayo, visiting Ghost Ranch and Georgia O’Keefe’s home in Abiquiu, or to Santa Fe to view “La Boheme” at the Santa Fe Opera. You can take an afternoon and drive The Enchanted Circle [through Angel Fire, Eagle Nest, Red River, Questa and back to Taos], for diverse and dramatic scenery. Or take an excursion to Ojo Caliente and soak in their mineral pools and relax with one of their spa treatments. Back at Desert Oak revel in your own secluded haven, a five-foot high walled courtyard gives you peace, quiet and privacy while you enjoy a view of majestic Taos Mountain, during your morning coffee or evening cocktails. When you are looking for lodging accommodations in Taos New Mexico, why choose a condo or a hotel? Choose the intimacy of renting your own private home. You can schedule massages or body work at either home or at Essential Massage’s own facility. If you are looking for the perfect property for a family reunion, office retreat, artist workshop or just a large gathering of friends. Give our second property, Compound at Stargazer, a try. With six bedrooms and four full bathrooms (sleeping 18), there is plenty of room for everyone. There is a newly remodeled kitchen and bath, plus an added 20′ x 30′ game room with a pool table. These two side-by-side homes boast spectacular views in every direction. There is a private hot tub and a fire pit for bonfires under the star-filled New Mexican sky. The compound is convenient to the historic town of Taos [3 miles] and Taos Ski Valley [18 miles]. It is the ideal base camp for all that Taos has to offer. 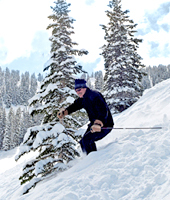 Continue on to see photographs and floor plans of Desert Oak and Compound at Stargazer and to learn more about Taos and Taos Ski Valley.